St John’s Shopping Centre Just Got Brighter. Whether you’re scaling a summit, walking the dog, or strolling through St John’s Shopping Centre, the UK-based company – sold in over 70 countries across the world – is all about making adventure accessible for everyone. Continually expanding its active wear, casual wear and swimwear collections, Trespass stays true to its core of being at home in the outdoors. To celebrate the launch, we have teamed up with Trespass to give you the chance to win a £100 gift card to spend instore! To be in with a chance of winning, simply head over to our Facebook page and follow the 3 simple steps. Click HERE to enter! 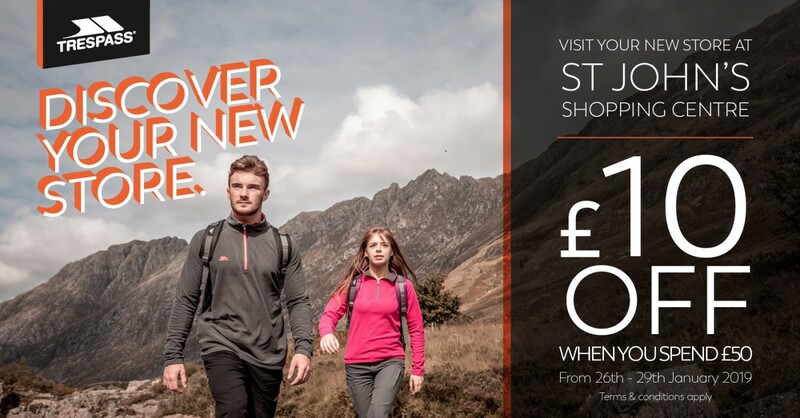 Visit your new store at St John’s Shopping Centre, Perth to get £10 off when you spend £50 or more between 26th – 29th January 2019!